What’s on the menu for your break today – if you get a break, that is? 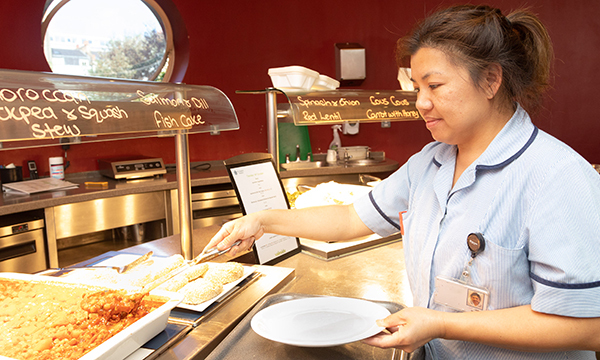 More than a quarter of hospital staff have no dedicated eating area or must put up with inadequate kitchens and microwaves, a Unison survey suggests. The poll highlighted a host of problems familiar to nursing staff in hospitals, including lack of free drinking water and nutritious meals during nightshifts. The survey found 71% of staff who eat at work said food preparation areas fall short of expectations, with 40% rating facilities as ‘bad’. Additionally, 26% of staff said they had no dedicated area where they can eat. Unison members are discussing the issue of hospital food at their annual health conference in Bournemouth this week. The union's head of health Sara Gorton said staff, as well as patients and visitors, need food that is heathy and reasonably priced. ‘Patients who are ill need nutritious and appealing meals to help them recover. Busy staff also need nourishing choices and proper breaks so they can recharge on hectic shifts,' she said. Unison conducted the survey in December 2018 among members in England, attracting 353 responses. Ninety-nine per cent of respondents worked in the NHS and 32% were nurses or midwives. NHS England has been invited to comment.